M.A.C.A.W. - Madison Area Cagebird Association of Wisconsin - From finches to cockatoos...We're friends you haven't met with a common interest...BIRDS! Just $20 for a one year family membership. 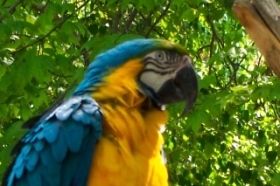 One quick and easy way to learn more about MACAW is to look through all our web pages and online newsletters. If you would like to receive a paper copy of the MACAW Flyer, please contact me and I will send you one. In the back of every issue is our membership enrollment form. Thank you for your interest in MACAW! We look forward to meeting you and learning about your birds! We're friends you haven't met yet with a common interest...BIRDS! Annual Membership dues are $20.00 per household. Please print this form out, complete the name and address information below. Bring this application to our club meeting along with your $20.00 check made payable to M.A.C.A.W. or mail to Ruth Gundlach, 9 Mark Twain St., Madison, WI 53705 for immediate membership. Upon receipt of your paid membership, we will send you your membership card and welcome letter. Thank you.